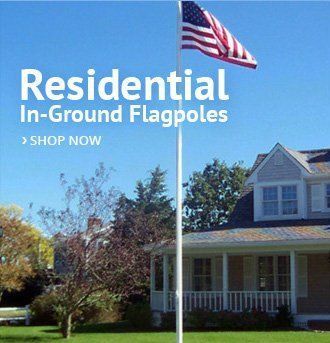 We offer the largest selection of flagpoles available on the internet. Our selection allows you to mount a small flag on the wall of your study, office or classroom, or raise a larger flag up to 150’ off the ground. 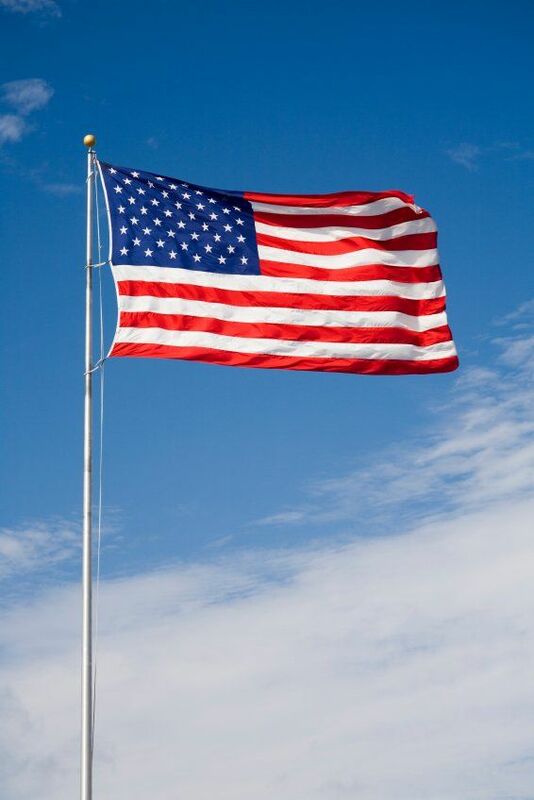 Most of our flagpoles are in stock and ready to ship anywhere in the United States. Commercial In-Ground Flagpoles - These poles are perfect for your office building, school or church. Ranging from 20’ to 150’ in height, these fiberglass, aluminum and steel poles are made in the U.S. and engineered for years of service. If you need something a bit different than you see here, feel free to call—we can help you find what you need. 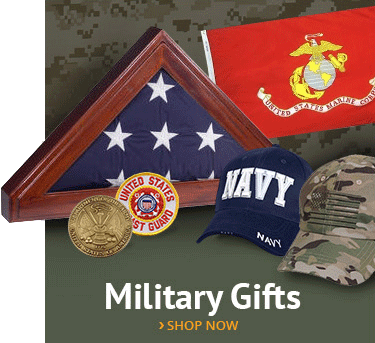 Indoor Flagpoles - Indoor flag displays are among the most dignified way to display the flag. Our poles, made of highly-polished oak and rich aluminum, will enhance all displays. Adding finials and ornaments, as well as cords and tassels, will complete the effect. Residential In-Ground Flagpoles - These poles, mostly between 15’ and 25’ feet in height, will suit most homes and lawns. Easily assembled and raised, they will last for years. 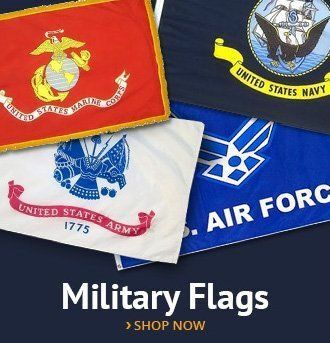 Home, Porch and Wall Mount Flagpoles - This line of high quality flagpoles offers a variety of ways to display your flags. Made of wood or aluminum, both our straight-hanging and spinning poles will serve you for years. 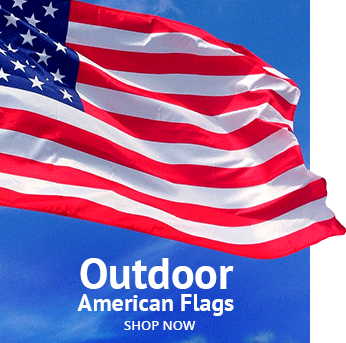 Outdoor Flagpole Components - These accessories will complete your outdoor display of patriotism. We offer clips and fasteners, flagpole lights, halyards and line, finials and many other enhancements for your display. Flag Brackets, Stands and Flagpole Accessories - These products will make sure your display is up and visible quickly and smoothly—with no fuss. 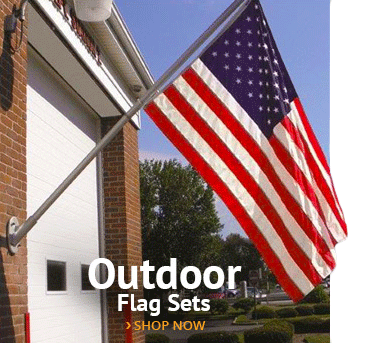 Advertising Flagpoles and Hardware - Fly your blade and feather flags, as well as your sales and store banners. These easy-to-install poles will be clearly visible to anyone passing by. Commercial Wall-Mounted and Roof Flagpoles - These installations are designed for heavy-duty outdoor use, either on the side or roof of your building. We even have corner mounts! They’re designed for ease-of-installation, low maintenance and high durability. Handheld, Tailgating and Other Flagpoles - These poles, designed for outdoor use, will make sure your patriotic display is portable—take it to the parade, to tailgate or any other location. Heavy Duty Flagpoles - For extreme conditions, you will want to install a flagpole which will endure. This line is designed for long-term use.